"In welcoming Urin, Putin commented on the Bolshoi Theatre’s great successes in artistic matters under his leadership"
Great news for lovers of order, peace and light within the Bolshoi. 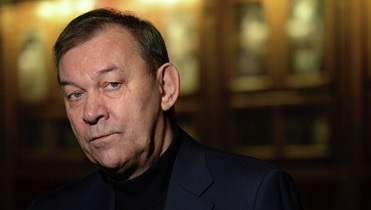 It's announced today that the genial Bolshoi Theatre chief Vladimir Urin is to stay on for a further term after his contract comes up next year. The Culture Minister Vladimir Medinsky took Urin to a meeting this morning with Vladimir Putin where he formally asked for presidential endorsement of the renewal. Putin: "So you've been there three and a half years?" Urin: "Yes, three and a half years already." Putin: "I've been consulting with the Minister and judging from the opinions of those who love theatre, you've been very successful in those three years." Medinsky: "Soon it will be Vladimir Georgievich's jubilee, and considering the outstanding achievements, both artistic and economic, of the Bolshoi Theatre, we have come to the government with the proposal - which I very much ask you to support - to prolong the contract with Vladimir Georgievich as head of the Bolshoi Theatre." The TV report summarises the reasons: that practically every production, according to the Bolshoi directorate, had been sold out. That the repertoire of the Bolshoi had been renewed, every season around eight premieres (Russians consider premieres as new productions, as well as new acquisitions and creations). That the theatre's income in the past two years had doubled, and in 2016 topped 2million rubles. Meanwhile sponsorship had doubled. That, as a result, Urin had noted, the Bolshoi Theatre had not asked for any further subsidy from the state. The financial results are probably understood as the primary evidence as far as the government is concerned - they were the reason Urin's adept predecessor Anatoly Iksanov lasted 13 years - but Urin also played the key hand in stabilising the theatre after the appalling scandal of the acid attack on the ballet director Sergei Filin by one of the dancers. It has long been discussed that other more divisive rivals for the job, particularly the disruptive former star Nikolai Tsiskaridze - who was open about his contempt for Urin and the previous leader Anatoly Iksanov - might be favoured, not least because Urin himself is in his late sixties and had said he wasn't against retirement and a quieter life. Recently the Culture Minister's establishment of a committee of theatre chiefs supposedly to solve artistic controversies nationwide has been read as a step towards censorship of out-of-step individuals, and Urin was reported to have expressed guarded support of it. I have no idea whether this has played any part in his contract negotiations, but since the Bolshoi Theatre's top seat is by far the most important in Russia's intensely protected cultural cosmos it has to be assumed that Urin is seen as a conciliator, rather than a challenger to government culture policy. The RIA official report below gives no details of the length of contract, but five years is standard, and would certainly allow a cautious and realistic accommodation to continue under Urin's wise gaze between the extreme nationalists flocking under Russian cultural banners and those who regard the Bolshoi as Russia's greatest international artistic brand. Here's my translation. Russia’s culture minister Vladimir Medinsky, after a meeting with President Putin and the Bolshoi Theatre’s general director Vladimir Urin, is proposing to extend Urin’s contract, due to his great experience and achievements. Urin has headed the Bolshoi Theatre since 2013. “Of course, I do so with pleasure,” said Putin. In welcoming Urin, Putin commented on the Bolshoi Theatre’s great successes in artistic matters in the past 3 and a half years under his leadership, and requested him to discuss further plans and issues.